Interior & Exterior Custom Sized ! 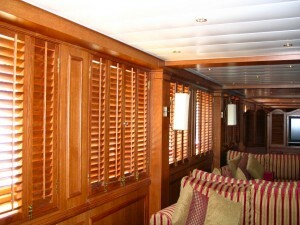 Since 1989, Kestrel has been a global provider of the finest quality interior shutters, exterior shutters and doors. 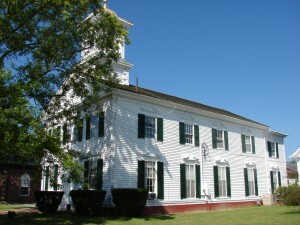 We are consistently specified for commercial and residential properties, for new construction and historic restoration. All custom sized wood shutters, interior doors and closet doors are made to order for you here in southeastern Pennsylvania. We start with only the finest quality hardwoods milled to precise tolerances. Frame components are joined using true, deep pocket mortise and tenon joinery, then pegged to ensure strength and durability for generations. Our solid hardwood sliding closet doors and sliding wardrobe doors are custom sized and are available in any Kestrel design of shutters and doors. 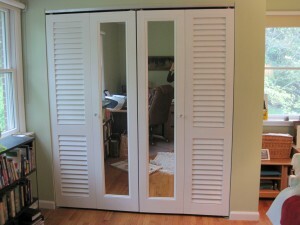 To compliment your new Kestrel sliding closet doors we offer high quality L. E. Johnson sliding closet door hardware. Sliding door hardware comes standard with hidden tricycle wheels fully enclosed in a top track and is available in 2 track systems as well as multiple single tracks so that all of your sliding closet doors can be stacked one behind the other. Kestrel Wood Exterior Shutters are hand made from clear, kiln dried Sapele Mahogany and feature authentic, true pegged, mortise and tenon joinery. We offer the greatest variety of historically accurate American and European designs of exterior shutters, completely custom sized. We can also match your existing exterior shutters and new designs. 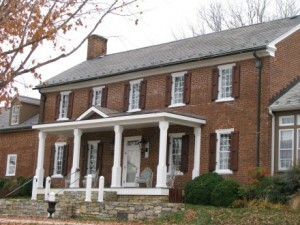 Our exterior shutters can be found on many buildings on the National Register of Historic Places including the FDR Presidential Library, Cape May County Courthouse and General Maxwell's Headquarters in Valley Forge National Park. Can I Use 2 Different Styles of Closet Doors Together? 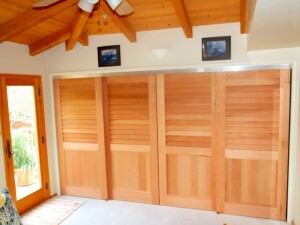 What Are Faux Louvered Doors? 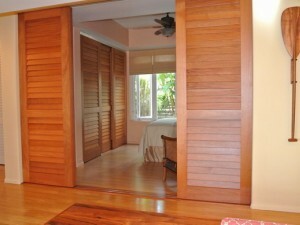 What are the differences between Interior Doors and Closet Doors? We offer our Board and Batten shutters in any size board width, customized to your needs. Our board and batten shutters are available with tongue & groove vertical boards (no air gap) and straight or beveled edges with an air gaps. Also available are breadboard ends (the above shutters show a breadboard top), "Z" battens and decorative cutouts. Our custom sized bifold doors are available in any design of Kestrel interior doors and can even be combined with different designs as shown in the picture above. Kestrel bifold doors are offered with high quality L. E. Johnson bifold door hardware to handle from 2 to 12 interior doors per opening. Kestrel Wood Bahama Shutters (sometimes referred to as Bermuda Shutters) are available with fixed or operable louvers in your choice of louver blade size. 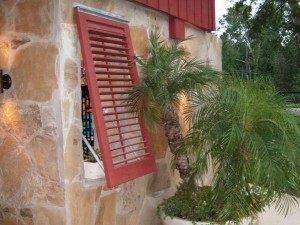 Our Bahama Shutters are custom sized and can be built with any number of vertical center stiles. We also offer a line of Aluminum Hurricane Shutters that are approved for use Florida's High Velocity Hurricane Zone (HVHZ). Kestrel interior and exterior louvered doors are available with 4 different louver blade sizes (1.1/4", 1.7/8", 2.1/2" and 3.1/2") and can be made as operable louvered doors, fixed louvered doors with ventilation and faux/false louvered doors without ventilation. Completely custom sized, our louvered doors are suitable for hinged, bifold, sliding and pocket door applications. Kestrel Closet Doors and Utility Doors are available in several designs include Plantation louvered doors, raised panel doors, bead board doors, tongue & groove doors and fitted for fabric, glass or mirrors and more. All Kestrel Doors are hand built using true pegged, mortise and tenon joinery and are suitable for your entryways, closets and rooms as hinged interior doors and exterior cabana doors, bifold doors, bypass/sliding closet doors and pocket doors. Kestrel Interior Shutters are made from clear, kiln dried Basswood and other hardwoods and are available fully assembled or in our exclusive The Original D.I.Y.Shutter kit™. We hand build our Custom Sized interior shutters to fit your windows, doors and cabinets in a variety of American and European shutter designs, like Plantation Shutters, fabric shutters and Bahama Shutters, as well as historic reproductions and custom shutters. Our interior shutters can be found on many buildings listed on the National Register of Historic Places including The Mark Twain Home, Yale University and The Mohonk Mountain House as well as more modern settings like the Disney Cruise Ships 'Wonder' and 'Magic'. 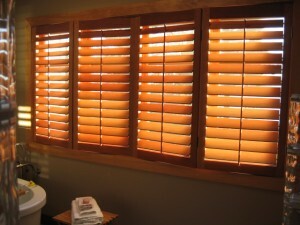 Our solid Wood Plantation Shutters are hand made, custom sized to your order. We mill our own hardwoods and build your Plantation shutters using traditional pegged, mortise and tenon joinery to insure the highest quality. Kestrel Plantation Shutters are available fully assembled and in our exclusive The Original D.I.Y.Shutter kit™. We now offer American Made Faux Plantation Shutters with a 25 year warranty. 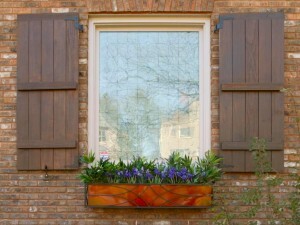 What if there is not enough room for exterior shutters? 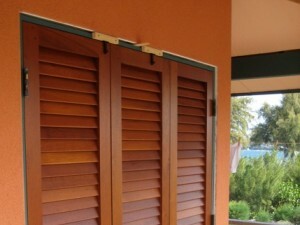 Hurricane Shutters − How Do I Know If Mine Will Meet Florida Code?